Treadwell's in London is all decorated for Yule. 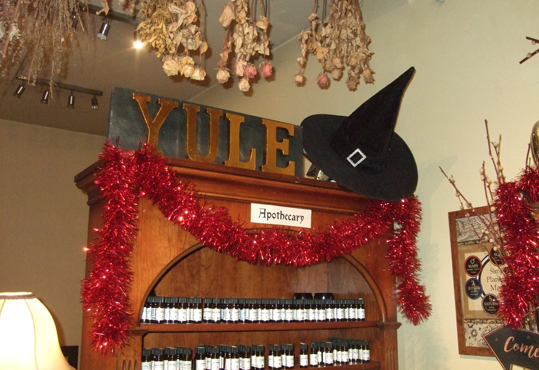 I took this photo yesterday evening, of the apothecary section all tinselled up, before running my candle magic workshop. The shop was open until late - as I believe it is every evening in the run-up to the Winter Solstice. There's was a lovely festive atmosphere there too. On Wednesday 12 December Treadwell's is also hosting an occulty Yule-themed drink and draw night, which sounds a lovely way to relax with friends and get into the spirit of the season. Treadwell's sells all sorts of witchy supplies as well being a fabulous occult book store and is at 33 Store Street, Bloomsbury, London WC1E 7BS. Tel: 0207 419 8507 or visit the website at http://www.treadwells-london.com/ You can also buy copies of my book Pagan Portals - Candle Magic there.